This month our event will take place at the wonderful Rose Garden Palace Hotel. The romantic name 'Rose Garden' was inspired by the rose bushes that grace the garden of the classic period building housing this new Roman hotel. 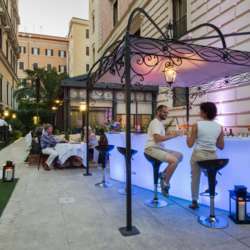 The location is one of the best you could imagine: in the heart of Rome where Via Boncompagni leads off Via Veneto next to the American Embassy on the most striking part of the famous street. From here you are within easy walking distance from Villa Borghese park, the Spanish Steps, the trendy bars on the Via Veneto. The hall on the ground floor has a crystal dome and the Il Roseto restaurant and American bar overlook the charming garden. You will enjoy a drink plus a wonderful buffet of apetizers. Feel super free to get in touch with me for any questions or to let me know if you'd like to bring international friends and colleagues: Please ask them to sign up on the InterNations website or just send a message on my mobile: +393396126031 with their names so as to add them to the guest list. Metro A direction Battistini get off at Barberini station and take bus bus 80 on Via Veneto. Get off after one stop near the Rose Garden Palace.